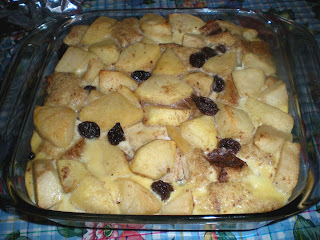 From my last conference, one great dessert that they made is bread pudding. It tasted so good that I have to try to recreate this recipe. 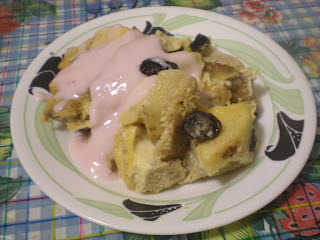 This morning, I was playing around with the ingredients and the quantity needed. It didn't turn out as the one at the conference, but still it tasted good. Here is my version, I'm open for suggestion on improving this dish. 1. In a small saucepan, heat margarine or butter over medium heat. 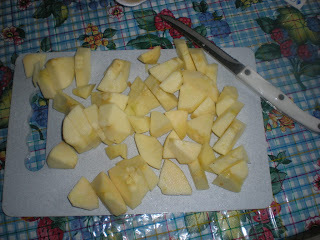 Cover and cook apples until soft. Stir occasionally. 2. 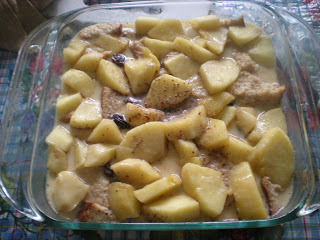 In a 8 x 8 inch baking pan, toss apples, raisins and bread. 3. In a medium bowl, beat eggs and sugar until dissolved. Blend in the milk, cream, vanilla and cinnamon. 4. Pour batter to bread. Cover and refrigerate for 30 mins. 6. Bake for 45 mins until the center cuts clean. 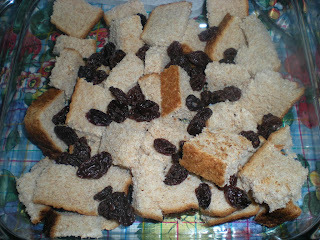 Let it cool and serve warm or cold with maple syrup or yogurt.